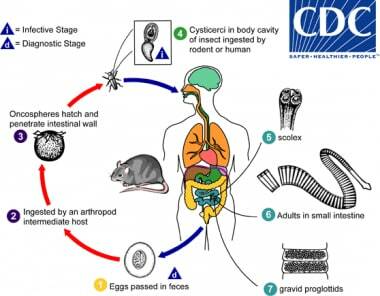 The life cycles consist of adult (tapeworm) stages in the small bowel of humans and rodents, and also larval tissue stages in insects (cysticercoid). In addition, the cysticer­coid stages of H. nana can also invade and develop in the human intestine thus is capable of completing its entire life cycle in the human host. H nana can also be transmitted through autoinfection without having to pass through the insect host. Life cycle of Hymenolepis nana. Courtesy of the Centers for Disease Control and Prevention (CDC at http://www.cdc.gov/dpdx/hymenolepiasis/index.html). Life cycle of Hymenolepis dimunita. Courtesy of the Centers for Disease Control and Prevention (CDC at http://www.cdc.gov/dpdx/hymenolepiasis/index.html). Eggs of Hymenolepis diminuta are passed out in the feces of the infected definitive host (rodents, man) (1). 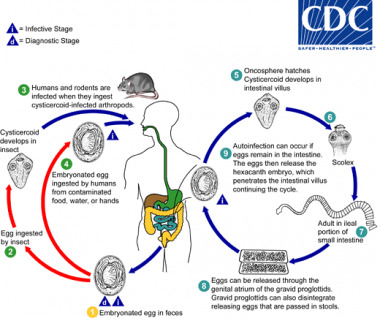 The mature eggs are ingested by an intermediate host (various arthropod adults or larvae) (2), and oncospheres are released from the eggs and penetrate the intestinal wall of the host (3), which develop into cysticercoid larvae. Species from the genus Tribolium are common intermediate hosts for H. diminuta. The cysticercoid larvae persist through the arthropod's morphogenesis to adulthood. H. diminuta infection is acquired by the mammalian host after ingestion of an intermediate host carrying the cysticercoid larvae (4). Humans can be accidentally infected through the ingestion of insects in precooked cereals, or other food items, and directly from the environment (e.g., oral exploration of the environment by children). After ingestion, the tissue of the infected arthropod is digested releasing the cysticercoid larvae in the stomach and small intestine. Eversion of thescoleces (5) occurs shortly after the cysticercoid larvae are released. Using the four suckers on the scolex, the parasite attaches to the small intestine wall. Maturation of the parasites occurs within 20 days and the adult worms can reach an average of 30 cm in length (6). Eggs are released in the small intestine from gravid proglottids (7) that disintegrate after breaking off from the adult worms. The eggs are expelled to the environment in the mammalian host's feces (1). Infection is most common in children aged 4-10 years, in dry, warm regions of the developing world. H nana infection affects millions of people, primarily children, worldwide. Estimated rates of infection in various regions range from 0.1-58%. It is estimated to have 50-75 million carriers of H. nana with 5 to 25% prevalence in children worldwide, which can be as high as 50% in children between 1-4 years of age. Regions with high reported infection rates include Sicily (46%), Argentina (34% of school children), and southern areas of the former Soviet Union (26%). In contrast, only 0.1% of stools examined at a children's hospital in Calgary were positive for H nana. Most cases with associated neurologic symptoms have been reported from the former Soviet Union. Morbidity is uncommon, only occurring when parasite burden is very high. Death has not been reported in association with this infection. No racial predisposition is known for hymenolepiasis. No gender predilection is known for hymenolepiasis. Parasites - Hymenolepiasis (also known as Hymenolepis nana infection). Centers for Disease Control and Prevention. Available at http://www.cdc.gov/parasites/hymenolepis/biology.html. Accessed: April 20, 2015. Kappus KD, Lundgren RG Jr, Juranek DD, Roberts JM, Spencer HC. Intestinal parasitism in the United States: update on a continuing problem. Am J Trop Med Hyg. 1994 Jun. 50(6):705-13. [Medline]. Church C, Neill A, Schotthoefer AM. Intestinal infections in humans in the Rocky Mountain region, United States. J Parasitol. 2010 Feb. 96(1):194-6. [Medline]. Parish RA. Intestinal parasites in Southeast Asian refugee children. West J Med. 1985 Jul. 143(1):47-9. [Medline]. [Full Text]. Molina CD, Molina MM, Molina JM. Intestinal parasites in southeast Asian refugees two years after immigration. West J Med. 1988 Oct. 149(4):422-5. [Medline]. [Full Text]. Staat MA, Rice M, Donauer S, Mukkada S, Holloway M, Cassedy A, et al. Intestinal parasite screening in internationally adopted children: importance of multiple stool specimens. Pediatrics. 2011 Sep. 128(3):e613-22. [Medline]. Crompton DW. How much human helminthiasis is there in the world?. J Parasitol. 1999 Jun. 85(3):397-403. [Medline]. Romero-Cabello R, Godínez-Hana L, Gutiérrez-Quiroz M. [Clinical aspects of hymenolepiasis in pediatrics]. Bol Med Hosp Infant Mex. 1991 Feb. 48(2):101-5. [Medline]. Suárez Hernández M, Bonet Couce E, Díaz González M, Ocampo Ruíz I, Vidal García I. [Epidemiological study on Hymenolepis nana infection in Ciego de Avila Province, Cuba]. Bol Chil Parasitol. 1998 Jan-Jun. 53(1-2):31-4. [Medline]. Sirivichayakul C, Radomyos P, Praevanit R, Pojjaroen-Anant C, Wisetsing P. Hymenolepis nana infection in Thai children. J Med Assoc Thai. 2000 Sep. 83(9):1035-8. [Medline]. Mirdha BR, Samantray JC. Hymenolepis nana: a common cause of paediatric diarrhoea in urban slum dwellers in India. J Trop Pediatr. 2002 Dec. 48(6):331-4. [Medline]. Chitchang S, Piamjinda T, Yodmani B, Radomyos P. Relationship between severity of the symptom and the number of Hymenolepis nana after treatment. J Med Assoc Thai. 1985 Aug. 68(8):423-6. [Medline]. Soares Magalhães RJ, Fançony C, Gamboa D, Langa AJ, Sousa-Figueiredo JC, Clements AC, et al. Extending helminth control beyond STH and schistosomiasis: the case of human hymenolepiasis. PLoS Negl Trop Dis. 2013. 7(10):e2321. [Medline]. [Full Text]. Juan JO, Lopez Chegne N, Gargala G, Favennec L. Comparative clinical studies of nitazoxanide, albendazole and praziquantel in the treatment of ascariasis, trichuriasis and hymenolepiasis in children from Peru. Trans R Soc Trop Med Hyg. 2002 Mar-Apr. 96(2):193-6. [Medline]. Parasites - Hymenolepiasis (also known as Hymenolepis nana infection). Centers for Disease Control and Prevention. Available at http://www.cdc.gov/parasites/hymenolepis/health_professionals/index.html. Accessed: April 20, 2015. BILTRICIDE® Package insert. Available at http://www.univgraph.com/bayer/inserts/biltricidetab.pdf. Chero JC, Saito M, Bustos JA, Blanco EM, Gonzalvez G, Garcia HH. Hymenolepis nana infection: symptoms and response to nitazoxanide in field conditions. Trans R Soc Trop Med Hyg. 2007 Feb. 101(2):203-5. [Medline]. Alinia® Package Insert. Available at http://www.accessdata.fda.gov/drugsatfda_docs/label/2005/021818lbl.pdf. Fox LM, Saravolatz LD. Nitazoxanide: a new thiazolide antiparasitic agent. Clin Infect Dis. 2005 Apr 15. 40(8):1173-80. [Medline]. King CH. Bennett JE, editor. Mandell, Douglas, and Bennett's Principles and Practice of Infectious Diseases. 8th edition. Philadelphia: Elsevier; 2014. 3227-36. AAP. Other tapeworm infections (including hydatid disease). Red Book: 2009 Report of the Committee on Infectious Diseases. 28th. Elk Grove Village, IL: American Academy of Pediatrics; 2009. 654-5. Alyousefi NA, Mahdy MA, Mahmud R, Lim YA. Factors associated with high prevalence of intestinal protozoan infections among patients in Sana'a City, Yemen. PLoS One. 2011. 6(7):e22044. [Medline]. [Full Text]. Church C, Neill A, Schotthoefer A. Seasonality of Parasitic Gut Infections in Humans in the Rocky Mountain Region, USA. J Parasitol. 2009 Oct 6. 1. [Medline]. Cook DM, Swanson RC, Eggett DL, Booth GM. A retrospective analysis of prevalence of gastrointestinal parasites among school children in the Palajunoj Valley of Guatemala. J Health Popul Nutr. 2009 Feb. 27(1):31-40. [Medline]. Diaz E, Mondragon J, Ramirez E, Bernal R. Epidemiology and control of intestinal parasites with nitazoxanide in children in Mexico. Am J Trop Med Hyg. 2003 Apr. 68(4):384-5. [Medline]. [Full Text]. Gilles HM, Hoffman PS. Treatment of intestinal parasitic infections: a review of nitazoxanide. Trends Parasitol. 2002 Mar. 18(3):95-7. [Medline]. Gonçalves AL, Belizário TL, Pimentel Jde B, Penatti MP, Pedroso Rdos S. Prevalence of intestinal parasites in preschool children in the region of Uberlândia, State of Minas Gerais, Brazil. Rev Soc Bras Med Trop. 2011 Mar-Apr. 44(2):191-3. [Medline]. Heukelbach J, Winter B, Wilcke T, et al. Selective mass treatment with ivermectin to control intestinal helminthiases and parasitic skin diseases in a severely affected population. Bull World Health Organ. 2004 Aug. 82(8):563-71. [Medline]. Juckett G. Common intestinal helminths. Am Fam Physician. 1995 Nov 15. 52(7):2039-48, 2051-2. [Medline]. Kabani A, Cadrain G, Trevenen C, et al. Practice guidelines for ordering stool ova and parasite testing in a pediatric population. The Alberta Children's Hospital. Am J Clin Pathol. 1995 Sep. 104(3):272-8. [Medline]. Katz M, Despommier DD, Gwadz RW. Tapeworms of minor medical importance. Parasit Dis. 1989. 88-92. Maggi P, Brandonisio O, Carito V, et al. Hymenolepis nana parasites in adopted children. Clin Infect Dis. 2005 Aug 15. 41(4):571-2. [Medline]. Marangi M, Zechini B, Fileti A, et al. Hymenolepis diminuta infection in a child living in the urban area of Rome, Italy. J Clin Microbiol. 2003 Aug. 41(8):3994-5. [Medline]. Marseglia GL, Marseglia A, Licari A, Castellazzi AM, Ciprandi G. Chronic urticaria caused by Hymenolepis nana in an adopted girl. Allergy. 2007 Jul. 62(7):821-2. [Medline]. Mehraj V, Hatcher J, Akhtar S, Rafique G, Beg MA. Prevalence and factors associated with intestinal parasitic infection among children in an urban slum of Karachi. PLoS ONE. 2008. 3(11):e3680. [Medline]. Olson PD, Yoder K, Fajardo L-G LF, et al. Lethal invasive cestodiasis in immunosuppressed patients. J Infect Dis. 2003 Jun 15. 187(12):1962-6. [Medline]. Patamia I, Cappello E, Castellano-Chiodo D, Greco F, Nigro L, Cacopardo B. A human case of Hymenolepis diminuta in a child from eastern Sicily. Korean J Parasitol. 2010 Jun. 48(2):167-9. [Medline]. [Full Text]. Pearson RD. Nitazoxanide As Treatment of Intestinal Parasites in Children. Curr Infect Dis Rep. 2004 Feb. 6(1):25-26. [Medline]. Quihui L, Valencia ME, Crompton DW, et al. Role of the employment status and education of mothers in the prevalence of intestinal parasitic infections in Mexican rural schoolchildren. BMC Public Health. 2006. 6:225. [Medline]. Quihui-Cota L, Valencia ME, Crompton DW, et al. Prevalence and intensity of intestinal parasitic infections in relation to nutritional status in Mexican schoolchildren. Trans R Soc Trop Med Hyg. 2004 Nov. 98(11):653-9. [Medline]. Rayan P, Verghese S, McDonnell PA. Geographical location and age affects the incidence of parasitic infestations in school children. Indian J Pathol Microbiol. 2010 Jul-Sep. 53(3):498-502. [Medline]. Richards FO Jr. Diphyllobothrium, Dipylidium, and Hymenolepis species. Principles and Practice of Pediatric Infectious Diseases. 2003. 1351-4. Rohela M, Ngui R, Lim YA, Kalaichelvan B, Wan Hafiz WI, Mohd Redzuan AN. A case report of Hymenolepis diminuta infection in a Malaysian child. Trop Biomed. 2012 Jun. 29(2):224-30. [Medline]. Rokni MB. The present status of human helminthic diseases in Iran. Ann Trop Med Parasitol. 2008 Jun. 102(4):283-95. [Medline]. Schantz PM. Tapeworms (cestodiasis). Gastroenterol Clin North Am. 1996 Sep. 25(3):637-53. [Medline]. Staat MA, Rice M, Donauer S, Mukkada S, Holloway M, Cassedy A, et al. Intestinal Parasite Screening in Internationally Adopted Children: Importance of Multiple Stool Specimens. Pediatrics. 2011 Aug 8. [Medline]. Tanowitz HB, Wittner M. Hymenolepiasis. Hunter's Tropical Medicine. 1991. 839-41. Turner JA. Cestodes. Textbook of Pediatric Infectious Diseases. 2004. 2797-816. Utzinger J, Botero-Kleiven S, Castelli F, Chiodini PL, Edwards H, Köhler N, et al. Microscopic diagnosis of sodium acetate-acetic acid-formalin-fixed stool samples for helminths and intestinal protozoa: a comparison among European reference laboratories. Clin Microbiol Infect. 2009 May 18. [Medline]. Weisse ME, Raszka WV Jr. Cestode infection in children. Adv Pediatr Infect Dis. 1996. 12:109-53. [Medline]. Wittner M, Tanowitz HB. Other cestode infections. Tropical Infectious Diseases: Principles, Pathogens, and Practice. 1999. 1026-30. H nana egg in an unstained wet mount. Courtesy of the Centers for Disease Control and Prevention (CDC at http://www.cdc.gov/dpdx/hymenolepiasis/index.html).